Keith Chegwin and Sally James, once arch rivals on television, face off again when they hunt for bargains at an antique centre in Chiswick, London. Browse content similar to Keith Chegwin and Sally James. Check below for episodes and series from the same categories and more! Hello and welcome to Bargain Hunt's Famous Finds. Our famous finders today became household names when they shot to fame on children's TV. Today we've brought them out for a fun-filled time here in Chiswick, at the Old Cinema. Except there won't be any popcorn on sale in today's matinee performance... Only antiques. Their game today will be going head-to-head against each other, hunting bargains. to find in here three antiques, or collectibles, with £300. They'll then whisk their pieces over to auction, hoping to make more money on them there. Let's meet the first of today's famous finders. For the red team, we have Keith Chegwin. As Cheggers passes 40 years in show business, there really isn't much he hasn't done. swapping the nation's unwanted toys on the multi-coloured Swap Shop. -I wonder where Keith is. -Oooh, it's absolutely freezing! Good morning, Noel. But today, it's all about swapping cash for bargains. So Keith, are we going to be able to keep up with you today? You haven't got a chance! I'll be like Roadrunner, all over the place. Can't wait! Who have you brought with you? My best mate, Steve Smith. -Morning, Steve, nice to meet you. -How do you keep him under control? He is irrepressible, isn't he? And a legend for being so irrepressible. We think we've got an eye for this. We're great fans of Bargain Hunt. -I'm glad to hear it! -We can't wait to do it. We'll find a Monet. -We hope you make plenty of "Monet", too! Let's find out who they're up against. For the blue team, we have Sally James. Just like Keith, Sally shot to fame through children's TV, working on the cult show Tiswas. and Sally enjoyed a reputation as being one for the dads. We get loads of letters in saying we all love Sally's tricks. so let's hope she gives what's showing today a five-star rating. So Sally, you're a local girl? I am, yes. I was born around the corner in Queen Charlotte's a few years ago. -We won't go into that! -Let's not go into detail, eh? Who have you brought with you to help out? -I've brought my husband, Mike. -Hello, Tim. Good to meet you. What sort of things will you be looking out for today? -We'll find something cheap and get it even cheaper. Of course, I've got to beat Keith. Keith and I are very, very old enemies. Years ago, he was on Swap Shop and I was on Tiswas, it was real rivalry then. And it's come to the surface again today, Tim! -So who got the top rating? -We did, we did, we did! -This is going to be an interesting battle. 300 smackers. You know the rules, your experts await and off you go! It's time for the teams to meet their experts. We've got two old pros today helping the teams find their objects. And for the blues, Mark Stacey. That has got to be worth some money! -He's gonna love you, isn't he? -We were looking in boxes. -Go on, you explain it. -OK. Gosh, what is it? What does it do? Is that the base to it? That sits on there. It's got a mechanism. -A cheap carcass, a kind of pine carcass. along that marquetry, that inlay, it's not painted. I think that's a really attractive piece. on holiday in Italy, on the continent. because of the work that has gone into making it. -I don't know! We haven't got any cigarettes, have we? -This pencil might work. That's Bakelite, that button. Drop the pencil in there. It's a real quirk, isn't it? Price wise, it's marked 140.
put a fixed price on. I love those items, because no-one knows what it's truly worth. He's the best haggler in the world. I put on a sad face and see what happens. He's been doing the sad face since we started. Oi! Watch it, Cheggers! Blakey from On The Buses? The reds bought the early 20th century cigarette dispenser for £90. Now, are the blues away to a healthy start? we've got the globe versus the scale. I like the globe, I really do. I think this is great from a geography point of view, obviously, but I just like them. I also like the scales, and you like them. on the side there, you know, with fruit here, or flowers. I really, really love the scales. I think they're a little bit different. And here we've got a continental set, these are French. Very earthy piece, we've got the battered steel item here with the little pendulum there working. We've got the little name here of a Paris maker, or it could be a retailer. It's likely to be a maker. And I think it's actually quite an appealing visual object. I do. What sort of age would this be? I would have thought we're looking at the end of the 19th century. -Right, what's the price of the globe? -What's the price of the scales? -75. I'm sure we can get them down, though. -Do you want my opinion? -I think this is nicer. -It's got more rustic charm. It's more substantial. -And there are a few globes around. -OK, we're going for this. Let's go. Let's get this priced up. So the blues tipped in favour of the scales, and weighed them in at £50. -What are they then, Steve? -This is obviously a pepper pot. I thought it was a stool for a small person. It could always be that. -I like those, though. Are they silver? -No, this is the problem. Solid silver is always good because it has a weight value. You can cash it in and it's an expensive commodity. -Prices are rising in the doomy economy. A good investment. But they aren't, because they're silver-plated. So underneath there is actually a copper barrel. But "barrel" is the key. I love the shape of them. Nice to hold, as well. Very tactile, absolutely right. And look at the quality. If I take yours, Steve, look at the machining, so precise. -And there's something on there, is there? A family has put their crest on a piece of silver plate. That tells you that it was a very good piece of silver plate when it was first made. -So it's got a good story behind it? -Yes, and look at the quality of the machining. Take your base off there. -Look at that. That's how you get the pepper in. That is very precisely machined. That's really nice, isn't it? What kind of period are we looking at here? The big thing is, how much, though? -I'd say 50 quid for these. Well you've bought them, thanks a lot. That's great! -I'm paying 22, but you've just bought them for 50. I think they're a steal, and if I can get them any less than that, come on! -Shall we have a go? It only took 15 of the reds' pounds to clinch the silver-plate pepper pots. Mark, we quite like these. Well, I think they're quite unusual. -Obviously they're to put in sandwiches. We've got no idea of prices, you'll have to advise us on this. -It's quite a lot of money. But we must appreciate the nonsense of them really. little stickers in their sandwiches? -I think they're so eccentric, aren't they? -I want a banana sandwich. -And they've got a lot of little blanks. -So you can make your own little sandwiches. That could look quite twee and quite unusual, couldn't it? -You could stick it in a banana as a bit of a joke. is a good retailer's mark like Asprey's or Cartier, something like that. of the early part of the 20th century, Edwardian period. -Smoked salmon, which is always going to be popular. We've got to do a deal on this. But I think there are still people out there who like collecting novelty items. It's a bit of a gamble but it's different. -And we wanted something different. -On your head be it! How quirky! The Edwardian silver sandwich markers set the blues back £110. I've found this curious-looking thing. I can't work out what it is. -We've got a brandy glass, an ice bucket. -A bar ornament of some sort. -Just threw that in there! It's very art deco. Now what's it made of? -I thought it was for straws. You couldn't have a straw that short, could you? Novelty-wise, I like the look of that. I think you're absolutely right. And it is so art deco, isn't it? Look at his face, and the dickie bow. Of course, this is a snapshot of 1920s and 1930s glamour. Is that gonna cost us a fortune? How much is that going for? Gosh, it's so difficult, isn't it? We've got two items exactly the same. In an auction, one cigarette dispenser, or novelty item from that period, is one thing. But two of them may draw more attention. One might help the other sell. I think it's a good gamble. It's a nice piece. And...I think we should knock them down a bit and see how we get on. -I'll leave that one to you. -Let me show you this little object. -I think it's rather charming. -It's actually a little pot pourri jar or incense jar. When you take it out, there's a little well inside. And if you look on the cover, it's got those little holes in it. -It is quite sweet, isn't it? We've got a lot of Japanese at home. That's quite nice. It's made of an earthenware that we call Satsuma. You see that little circular mark there with the gold cross in the middle? That mark represents the Prince of Satsuma. And you've got the artist's signature here, which I don't know. What I particularly like about it is the fact that it's well modelled. I think the elephant's quite cheeky. If you look at his eyes, he's got quite a lot of character there. But the whole thing is covered in this wonderful iron red. Mark, this is really interesting, but the punchline is, how much is it? -He gets straight to the point, doesn't he? -Straight to the point, yes. -I think that's too much. -I think it's too much. -But we'll get it cheaper. I think we will. And also, they say elephants bring luck. -Let's have it. We'll do a deal. at the auction if the Japanese jumbo brings them any luck. Right, that's it. The teams have got their three bargains. Let's have a quick reminder as to what the reds bought. ebony-veneered cigarette dispenser, which they swapped £90 for. We like the cigarette dispenser because of the mechanics and the way it works. It really is unique. The silver plated pepper pots were next. In the bag at £15. -Quality, yeah. They're full of quality. It's really weird that we found another smoking machine. and landed another cigarette dispenser, this time art deco. The blues started proceedings with a split decision. Edwardian globe or 19th century scales. In the end, Sally won and tipped the decision her way. I think they could make us a lot of money. a set of six silver and ivory sandwich markers circa 1920. And last, but not least, Mark said elephants bring good luck. Let's hope it's true with their Satsuma elephant pot pourri jar! That'll make a lot of lolly. There's nothing for it but to head off for the auction. to see how auctioneer Daniel Webster rates our items. Keith Chegwin and his mate, Steve, the first item they went with is this cigarette dispenser. -It's a good decorative thing. I don't think it's ivory inlaid, thought. It's probably ivorine. -That's that plastic substitute type ivory, isn't it? So it looks the part, but unfortunately, isn't quite. -I've got 30-50 on it. Oh dear, £90 they paid. £90. That's a steep hill to have to climb, isn't it? They'll be struggling, I think. What about the pepper pots - do you like those? They're nicely crafted, they're well made. Plated not silver. With that quality, you'd almost expect them to be silver. You'd think so. They've been crested and everybody's taken a lot of trouble with them. -We've got 10-20 on them. -£15 they paid, so they're slap bang in the middle. They might just take off a bit? -They could do OK with those. Good old Keith! What do you think of that deco bartender? It's very much of the period, very sort of jazz age with the bartender mixing his cocktail. Quite a nice thing actually. It should do quite well. He's got this nice surprise inside. What do you think it's worth? We've got 30-50 on it, Tim. -And I think it should hopefully make upper. So they're well in there. Let's not get too cocky about it, and go and have a look at their bonus buy. Keith and Steve, you've spent £143, giving David £157 of leftover lolly. -Keith, it's style and sophistication, that is. But it's a tin Loch Ness Monster doubling up as a toffee jar. -You had 157 quid. And how much have you spent on that? First of all, I've got to tell you how old it is. It's 1930s, maybe 1940. So, 35. 35? How much do you reckon that's going to make at auction then? There might be 20 quid in it. There might also be a 20 quid loss! But you don't have to decide now. You decide after the sale of your first three items. But for the viewers, let's find out what the auctioneer thinks about the toffee tin. What about that for a belter of a toffee tin? And it's a McBowser toffee, which must be something to do with Callard and Bowser, I would guess. But it's a good period tin, isn't it? It is, yeah. And the Loch Ness monster again, it's an unusual thing. -Not many have ever seen that actually. We've gone a stingy five to ten on that. Is that all? Oh, Lord! £35 David Harper paid for that, out of which he hopes to make a stonking profit. You just never know at auction, do you? That's what's so lovely about it. Anyway, that's it for the reds. Now for the blues. Sally and Mike. Their first item are these sandwich markers. -Now I've never seen a set like this. Silver and ivory, nicely crafted, well made things. an unusual thing, I don't see much use for them in today's age. Unless you're a sandwich freak! You're gonna be working hard tonight, I tell you, Daniel. What about the little Japanese elephant - do you like that? I do. It's a good example of early 20th century Satsuma. Nicely painted. Unfortunately, the lid has been restored just there. -Which has knocked its value down. -Cleverly done though, isn't it? -It's been well done and, yeah, you have to look hard to find it. Yes, you've got to be quite sharp on that. Without the damage it would have been a good £100. Good luck with that, Daniel. And lastly then are the set of French scales. Pretty well complete but mean with the weights, I'd say. -Just two miserable weights. You want a whole set of weights for that. It's got the Parisian maker on the centre there. And it's got a nice distressed look, which is quite desirable these days. -What do you rate it at then, the scales? -We've got 40-80 on that one. That's fine, they only paid 50, so Sally will be pleased with that. Anyway, let's go and have a look at their bonus buy. -Sally and Mike, you ready for this? £40 of leftover lolly went to Mark Stacey. What did he spend it on? It's a little silver gilt 1970's broach, German. -How much did you spend on that, Mike? And how much do you think we might possibly get for that? These sort of things are back in fashion. If you look at it, the quality's quite nice. I like the way that's turned over there. That's very unusual. I quite like that. -I thought maybe £50 or so. -You see, I love jewellery. You've got the right thing for me there, Mark, I have to tell you! Yes, let's ditch our stuff and go with this! So we're predicting a profit on it. You're not deciding now, but for the viewers at home let's find out what the auctioneer thinks. It's a neat little thing, isn't it, yes. With this bark effect, very archetypal of the period. Possibly a thing of the future. That should be what we're all buying. Well, depending on the price. £35 is what Mark Stacey paid. Good. You're gonna need it. This is really nerve-wracking, having something in an auction that we bought. And is it going to make a profit? Do you see any profits? Can I see a profit? I've got a security van outside ready to take the cash! First up is the cigarette dispenser, your one, Keith, and here it comes. Cigarette dispenser. £30 I have. At £30, it's here with me, at 35, 40. At £40, still here at 40. It's worth more than that, isn't it? -Sorry, old fruit, that's minus 50. A pair of mid-20th century pepper pots. £5, no money. Five's here. Eight, ten - one more takes? No? At £10, it's here with me at 10. £30 for this one. At 30, 30's bid. I'll take two if it helps? £52. You're minus £41 overall. -Are you going to go with the bonus buy or not? -I reckon it will sell. -Yes. I'm fed up of sweating on this show. I want David to sweat. -Are you gonna trust him? We're going with the bonus buy. Here we go. there you go, bit of fun. And everyone wants it. 35, 40 got. Five, 100 with me. At 100. 110. 20. 30. Five, 40, it's yours. I can't believe this. Overall then, you are plus 64. You know, I watch Bargain Hunt so much and I don't see many people making a profit, but we've done it! And not just once, you've done it 64 times. £64 profit. Promise me something - say not a word to the blues, OK? -Don't say a word to those blues. And we'll reveal all in a minute. Well done though, well done. Great choice to go with the bonus buy. Now, how will the blues compare with that? -Feeling a bit nervy? How does it feel? I love this sort of thing. I love a good deal. Well, we hope you're going to get a good deal. First up are the sandwich markers, and here they come. Unusual and smart in their original case, there you go. At £55, are we all done? 60 at the back there. 60, are we all sure? £60 - that's not even a club sandwich. Minus 50 on that. Next, the Satsuma. It's with interest at 65, 70 got. At £70, the money's here at 70. Five, 80. Five, 90. Five, 100. 150, it's yours. At £150, we done? Yes! That is fantastic! 150, wiped your face, plus 50. A set of 19th century French shop scales. At £30, somewhere... 30's bid now. Five - against you at five, sir. 40, 40... At £40, are we done and sure at 40? £40, you're minus £10 on that. Overall that means you're minus £10. Now that could be a winning score, or you can risk it and go with the broach. -All right, go for it. -You sure you wanna do that? You're gonna go with, Sally's choice. We're going with the bonus buy, with the broach, here it comes. Silver gilt, German, £10 for it. At 15, are we all done? -Oh no, I don't believe this. Minus 20 on that, which overall is minus 30. -I said we shouldn't have done it! -That could be a winning score. Say nothing to the reds. Well, this is the moment where I have to reveal who's the winner and who's the runner-up. We have no losers on Bargain Hunt, just a runner-up occasionally. I have to reveal to you that the runners-up today are the blues. -I had a feeling you may be going to say that. It's only minus £30 overall and there is no shame in that. -You've been a fantastic team. Can I just say, it's not the winning, is it? It's who you beat! No, they've been such good fun, I can't tell you. -Honestly, Sally and Mike, excellent. -They're all so lovely to one another. But I have to tell you that you're going to take home money. You're going to take home £64. (KEITH) And it's building up interest as we speak. -What will you do with your £64? -We're giving it to charity. Steve's got a nominated charity in Bournemouth, a multiple sclerosis centre there. -That'll go down really well. Congratulations again. What a great show! 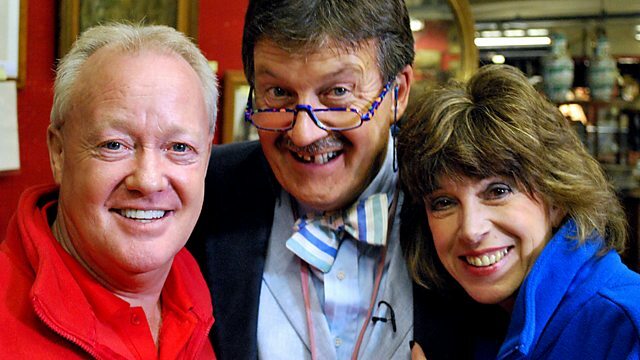 Keith Chegwin and Sally James, once arch rivals on television, find themselves facing a different kind of competition when they hunt for bargains at an antique centre in Chiswick, London. Sally takes time out from her shopping to chat to presenter Tim Wonnacott about her father, Bert Cann, a photographer who shot many of the most iconic images of movie and media stars in the 1960s and 70s. Tim also discovers Keith collects coins and borrows a few special examples any collector would love to own. While a lot of water has gone under the bridge since their Saturday morning rivalry, it's clear there is still some competition in the air when their items are sold at auction in Wandsworth. Who is going to get the highest figures this time round?